We are a leading Manufacturer of designer crete silk kurti, fancy georgette kurti, ladies georgette kurti, digital print kurti, full length kurti and modern kurti from Ahmedabad, India. In order to comprehend and meet the diverse demands of clients, we are able to offer an extensive array of Designer Georgette Kurti. The offered Fancy Georgette Kurti is tailored using high quality fabric that is procured from reliable sources of the industry in compliance with defined industry norm. In order to comprehend and meet the diverse demands of clients, we are able to offer an extensive array of Ladies Georgette Kurti. With our rich industry experience, we are engaged in offering DIGITAL PRINT KURTI to our clients. The offered suits are designed and stitched by a skilled team of designers using high grade fabric and other basic material, sourced from reliable vendors of the market. These suits are highly demanded in the global market for its sizes, shapes and designs. Clients can avail our offered from us as per their precise needs. With our rich industry experience, we are engaged in offering FULL LENGTH KURTI to our clients. The offered suits are designed and stitched by a skilled team of designers using high grade fabric and other basic material, sourced from reliable vendors of the market. These suits are highly demanded in the global market for its sizes, shapes and designs. Clients can avail our offered from us as per their precise needs. With our rich industry experience, we are engaged in offering MODERN KURTI to our clients. The offered suits are designed and stitched by a skilled team of designers using high grade fabric and other basic material, sourced from reliable vendors of the market. These suits are highly demanded in the global market for its sizes, shapes and designs. Clients can avail our offered from us as per their precise needs. In order to comprehend and meet the diverse demands of clients, we are able to offer an extensive array of¿¿kalamkari kurtis. 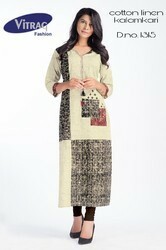 With our rich industry experience, we are engaged in offering STRAIGHT KOTI KURTI to our clients. The offered suits are designed and stitched by a skilled team of designers using high grade fabric and other basic material, sourced from reliable vendors of the market. These suits are highly demanded in the global market for its sizes, shapes and designs. Clients can avail our offered from us as per their precise needs. With our rich industry experience, we are engaged in offering YELLOW STRAIGHT KURTI to our clients. The offered suits are designed and stitched by a skilled team of designers using high grade fabric and other basic material, sourced from reliable vendors of the market. These suits are highly demanded in the global market for its sizes, shapes and designs. Clients can avail our offered from us as per their precise needs.